Migrating to the cloud increases business revenue by 40% on average (Silver Lining). But it’s a waste of your time, money and resources to use cloud technology without the right skills. 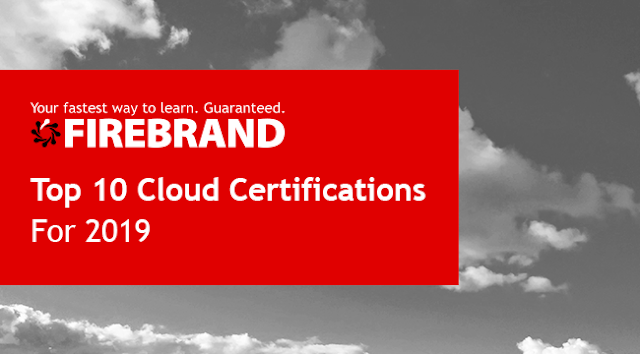 With 100s of cloud certifications on the market, it’s hard to know which is best for you and your business. This list (in no particular order) covers certifications from Microsoft, Amazon Web Services, CompTIA, Cisco and more. In 2019, cyber security is more important than ever. (ISC)²‘s CCSP certification is an expert level cloud security certification that builds on the CISSP. The CCSP teaches you everything you’ll need for managing and securing cloud environments. Cloud+ is an ideal way to start a career in the cloud. It's a follow on from the A+ and Network+ certifications, and a reliable entry level certification. Cloud+ is specifically aimed at professionals with 1-2 years’ experience working with data centre admin, networks and storage. Micrsoft have just released three new role based certifications to replace the Microsoft MCSA: Cloud Platform & MCSE: Cloud Platform and Infrastructure. The first of these, Microsoft Certified Azure Administrator Associate will give the broad range of skills needed to be a cloud administrator, including provisioning and monitoring resource and handling requests for infrastructure, applications and environments. Get all the knowledge and skills you need to be a cloud developer. This certification replaces 70-532: Developing Microsoft Azure Solutions. It was developed using advanced Job Task Analysis – you’ll become an expert in designing and building cloud applications and services. Get trained and certified on Microsoft Certified Azure Developer Associate in just 4 days with Firebrand – that’s 50% faster than traditional training. Prove your expert skills with this certification for cloud solutions architects. You’ll get advanced Azure skills and learn how to translate business requirements into secure, scalable and reliable solutions - with skills across compute, network, storage and security. This certification covers content from the retiring Microsoft MCSA: Office 365. The role-based certification gives you the skills to evaluate, plan, migrate, deploy and manage Microsoft 365 services. This certification is designed for Microsoft 365 Enterprise Administrators and includes Office 365 Management as well as Identity, Security, Compliance, Device and Tenant and Service Management. With 68% of the market in 2018 (RightScale) Amazon Web Services (AWS) is the current cloud market leader. The AWS Certified Solutions Architect – Associate is the first level of AWS certifications but it’s definitely not entry level. It’s designed for solutions architects, developers and SysOps administrators. This advanced AWS course gives you the expert level skills you need to design dynamically scalable, highly available, fault tolerant and reliable applications on AWS. Building on the Associate certification, AWS's Certified Solutions Architect – Professional builds skills like protecting your infrastructure from DDoS, encryption, moving large data and managing multiple accounts. If you’re an AWS Developer this is the ideal certification for you. It covers everything from introducing development on AWS, to connecting applications and data using event drive processing and building secure and scalable applications. Achieve it in just 3 days. Cisco’s associate-level certification is for cloud engineers and administrators who want to prove their ability to support cisco cloud solutions and understand cloud infrastructure and deployment. It’s a job-focused certification that will qualify you to enter roles like cloud engineer, cloud administrator, or network engineer.